Do plants have feelings? The amazing life of plants. 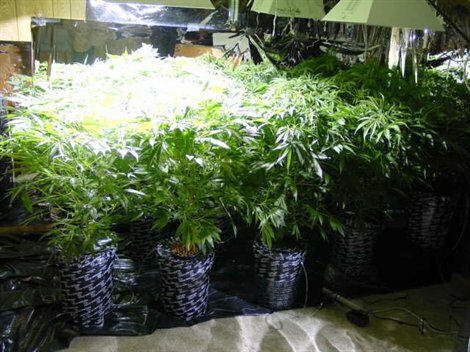 While visiting a friend in Australia many years ago, I was invited to see a large marijuana growing operation which used hydroponics and halogen lights. The garden was in a large room and the pants were arranged in neat rows. On one side of the room the plants seemed taller and fuller, gradually diminishing as they were positioned away from one particular corner. I mentioned the obvious difference to the owner of the operation and he explained that the corner with the most productive plants was where he had his stereo. Curious, I asked him what kind of music the plants liked. He told me they preferred mostly classical but that he had recently had better results with recordings of crickets. According to the gardener, crickets usually chirp right before a rain. He theorized that the sound tricked the plants to open their stomata's, the breathing pores on the underside of the leaves, and he gave them a mist containing Miracle-grow which they readily absorbed. Can plants actually hear sound? This was the conclusion of Cleve Backster back in the 1960s. He's the former CIA interrogation specialist that connected polygraph sensors to plants and discovered that they reacted to harm (i.e. cutting their leaves) and even to harmful thoughts of humans in proximity to them. Backster decided on impulse to attach his polygraph electrodes to the now-famous dracaena in his office, then water the plant and see if the leaves responded. Finding that the plant indeed reacted to this event, he decided to see what would happen if he threatened it, and formed in his mind the idea of lighting a match to the leaf where the electrodes were attached. One of the most important things that Backster discovered was that, instead of going ballistic, plants that find themselves in the presence of overwhelming danger simply become catatonic! This phenomenon has posed endless problems for those researchers who, unlike Backster, do not respect the sentience of their subjects. Under such circumstances, the plants they are studying evince no reaction whatsoever. They simply "check out." Backster termed the plants' sensitivity to thoughts "primary perception," and first published his findings from the experiments in the International Journal of Parapsychology. His work was inspired by the research of Sir Jagadish Chandra Bose, who claimed to have discovered that playing certain kinds of music in the area where plants grew caused them to grow faster. Apparently this is true. An Indian scientist, Dr. Jagadishchandra Bose, invented a instrument named crescograph and did many experiments on plants. A famous biologist, Dr. Bose showed that plants can feel, in their own way. "Suppose there is a lush green plant and its leaves are a sparkling green in the shining sunlight. We feel like pulling out a leaf to feel it. But we do not think of what goes on inside the plant. Maybe, we feel that the plant does not suffer like us. But the plant does suffer. In fact the pulsation of the plant stops where the leaf was plucked. In a short time the pulsation again begins at the spot, but this time very slowly. And then it completely stops. That spot is as good as dead for the plant." Dr. Bose also expounded on the 'nervous mechanism' of plants -- the ability of plants to recognize and react to the individual who has committed an act of violence (particularly toward a plant) in their 'presence'. Darwin was fascinated by the reactions of plants to external stimuli -- especially with carnivorous plants such as the Venus flytrap (Dionaea muscipula). He believed its almost instantaneous response touch and the way the plant snapped its trap shut around an insect indicated the presence of a central nervous system - such as that of an animal. Between 1960 and 1970, Burdon-Sanderson conducted many experiments on the Venus flytrap. The first experiment, and possibly the most remarkably revealing of all, was to attach electrodes to the surface of the trap lobes in the hope of recording electrical activity. He found that each time a trigger hair was touched it fired off a wave of electrical activity almost identical to the nerve impulses, or action potentials, produced by animal neurons. This experiment was carried out on the Sundew and Sensitive plant -- all with similar conclusions! Researchers from Michigan State University have also recently discovered that plants have a rudimentary nerve structure, which allows them to feel pain. According to the peer-reviewed journal Plant Physiology, plants are capable of identifying danger, signaling that danger to other plants and marshaling defenses against perceived threats. According to botanist Bill Williams of the Helvetica Institute, "plants not only seem to be aware and to feel pain, they can even communicate." This research has prompted the Swiss government to pass the first-ever Plant Bill of Rights. It concludes that plants have moral and legal protections, and Swiss citizens have to treat them appropriately. Vegetarians would do well to investigate this data before claiming to be superior to those of us who do not subscribe to the idea that eating meat is morally wrong. Now with modern day equipment, plant physiologists are beginning to understand much more about plant movement. It has been confirmed that the impulses Burdon-Sanderson detected are indeed action potentials similar to those in animals, they are also now beginning to unravel the molecular and cellular reasons of the ability of plants to respond to touch. But the question remains, do plants have actual feelings? If plants can hear, can they also feel? They have no nervous system as do animals, yet there is strong evidence that they are capable of sensing their environment and of reacting to it in ways that mimic emotion. An example of a complex reaction that suggests plants have feeling is their observed altruism, defined as the unselfish concern for the welfare of others by demonstrating behavior that is detrimental to the individual but favors the survival of its relatives. In the animal world, a parent might sacrifice their life for their child. A soldier might be called "altruistic" if he falls on a grenade to protect his comrades. Members of a family of apes spend time and effort on grooming eachother's coat. But can a plant be altruistic? Although plants have the ability to sense and respond to other plants, their ability to recognize kin and act altruistically has been the subject of few studies. But recently, as reported in ScienceDaily, some scientists explored kin recognition in Impatiens pallida (yellow jewelweed) [below] and found that they did exhibit altruism. Yellow jewelweed individuals are often found growing in close proximity to related individuals and are known to respond strongly to aboveground competition -- especially for sunlight -- making this species a likely candidate for kin recognition. By putting their resources into their leaves, the plants can grow quickly to cover the competition's leaves and steal their sunlight. They can also stimulate their root growth and crowd out the root system of neighboring plants. 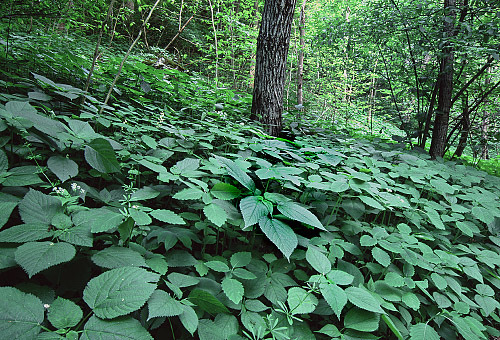 But the yellow jewelweed plants don't do this when the neighboring plant is one of their kin. Among close relatives, the plants did not increase resource allocation to roots or leaves. Rather, they altered their morphology by increasing stem elongation and branching. This appears to be an example of the plants cooperating with kin by attempting to acquire needed resources without shading nearby relatives. For Impatiens plants grown with strangers, the plants increased their resource allocation to their leaves relative to allocation to stems and roots, an indication of a competitive response. These differences in response based on the presence of kin or strangers were only observed in those plants grown with root neighbors, indicating that communication among roots may be necessary for plants to recognize kin. This was verified in other experiments in which root secretions from related and non-related plants of the same species were exposed to seedlings and their subsequent root growth was measured. Roots were significantly shorter when exposed to related root secretions. These finding might have important impact on crops grown from related seeds, such as corn and soybean. It suggests that stronger root systems result from more diversity. But it could also impact your home garden. Often we'll put plants in the ground next to each other and when they don't do well, we blame the local garden center where we bought them or we attribute their failure to a pathogen. But maybe there's more to it than that. Maybe it's a case of a family feud. Plants also cooperate with unrelated members of their own species. 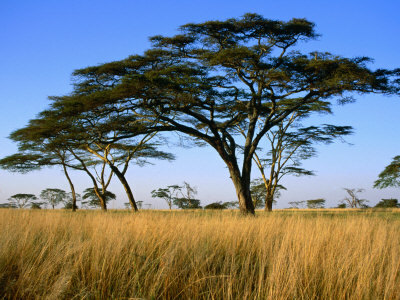 Acacia trees produce tannin to defend themselves when they are grazed upon by animals. The airborne scent of the tannin is picked up by other acacia trees, which then start to produce tannin themselves as a protetction from the nearby animals. 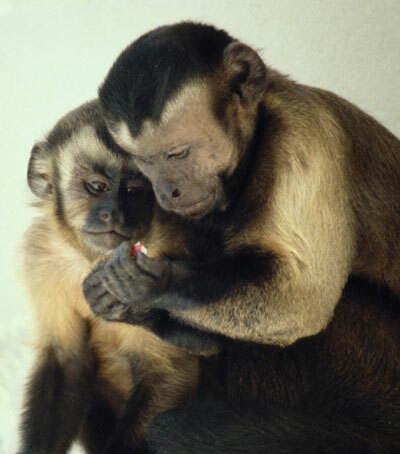 Plants have been known to use chemicals to interact with animals. When attacked by caterpillars, some plants can release chemical signals to attract parasitic wasps that attack the caterpillars. Orchids are famous for this. Having no sugar to tempt an insect to spread their pollen, some orchids lure them with the scents of more rewarding flowers or mimic the appearance of potential mates. A species of orchid, which lives on the Chinese island of Hainan, fools its hornet pollinator by issuing a chemical that honeybees use to send an alarm. The discovery explains why the hornets, which capture honeybees to serve as food for their larvae, have been observed to literally pounce on the rewardless Dendrobium sinense flowers. The compound the orchids produce is a rarity even in the insect world and has never before been described in any plant. There exists some sort of communication between a fungus garden and workers of the leaf-cutting ant Atta sexdens rubropilosa. If the garden is fed with plants that are poisonous for the fungus, it signals this to the ants, which then will avoid fertilizing the fungus garden with any more of the poisonous plant. Plants are survivors so it is not surprising that they have developed the abilities to communicate and cooperate with eachother. They evolved long before animals and have surpassed all other species in their size and longevity. 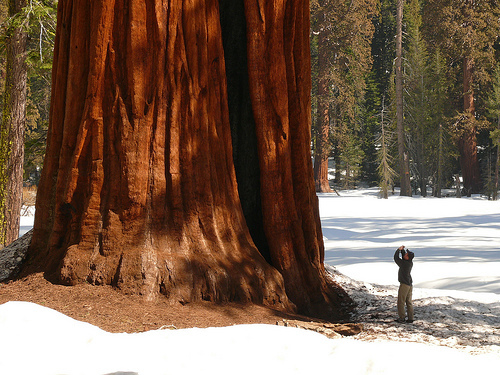 An individual plant of giant sequoia (Sequoiadendron giganteum) in Sequoia National Park, California, named the "General Sherman Tree" is considered to be the largest living plant, as well as the largest living thing on Earth. It is a cone-bearing gymnosperm with a height of 84 meters (275 feet) and a measured trunk girth of 31.3 meters (102.6 feet). This plant has enough wood in its trunk to supply the lumber to build about forty small houses. What you see is much larger than it appears! In the Malheur National Forest of eastern Oregon, a really gigantic specimen of Armillaria ostoyae, or the Honey Mushroom, is growing. The fruiting bodies of this vast organism are seen as clusters of mushrooms, but the continuous underground part of the fungus extends over 3.5 miles and an area of around 2200 acres. Such size is not attained without age, and this organism has been dated variously from 2400 years old to over 7000 years old. The presence of this large organism is not a friendly event for many evergreen trees in the area, as this fungus is also known as root rot. Quite a few trees have succumbed to the ravages of this relentless creature. Periodic forest fires keep it at bay, but the dry climate discourages the growth of competing fungal colonies. 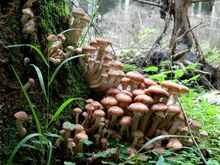 Scientists studying this humongous fungal specimen were able to determine that it is one vast organism by doing detailed DNA analyses of samples from widely separated locations. The samples proved to have the same genetic constitution, even when separated by acres. Thus the results of the study confirmed that this specimen of Armillaria was indeed a single connected specimen rather than separate organisms of the same species. 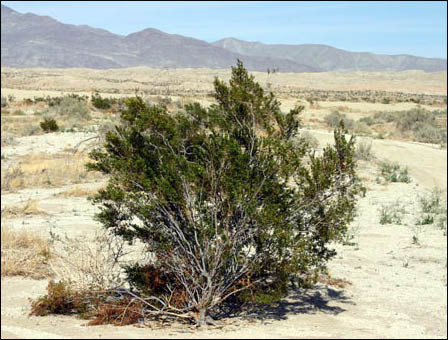 A single individual plant, the creosote bush, in Southern California (Larrea tridentata of the sunflower family [Asteraceae]), is estimated to be 11,700 years old.